On 22 October we had a party to celebrate the 25th anniversary of BGB. The chosen place was the reception rooms of Casa de la Seda, which is in the same building as our offices. There were 60 people from the BGB team at the celebration, and over a hundred people more who were former workers, partners, Governmental officials, hotel concierges, and many clients: all friends who have helped us build Barcelona Guide Bureau. I would like to thank them all for their collaboration during these 25 years. We started in 1990, 8 friends, all freelance local guides, who simply wanted to improve their working conditions, share the work and clients, share out the holiday schedule, etc. It was all very simple and from the very beginning we focused on providing excellent quality service. The business incubator Barcelona Activa helped us start up, especially during the first year. We were full of enthusiasm and ideas, we spent hours meeting to push and promote the project, learning how to manage a business. The 1992 Olympic Games were close and it attracted many visitors to come and visit Barcelona, each year there were more cruises and tourists with very different expectations. We became a cooperative after the Olympic Games. It gave us many advantages, especially in tax relief, which helped us move forward and we grew from 8 to 16 partners. Later on we founded the present society with the same members, which allowed us to grow further and provide more work to people besides the partners. We saw that, along with the low-cost airline success, there were more and more people that travelled on their own rather than in an organized group. These travellers still wanted a city tour to discover Barcelona, so we went a step ahead and created our own tours, besides providing guiding services. We became a travel agency and in 2008 created the Barcelona Daily Sightseeing Tours. We are now 60 people working at BGB in the various departments: booking, dispatchers, finances, marketing and sales, and guides. 25 years have been the greatest part of our professional life, and many of us are here from the beginning. The family is growing and we want it to continue. We are members of the city’s Convention Bureau, Diputació de Barcelona and Agència Catalana de Turisme. On an international level, we are members of the European Tour Operators Association. We have our own Training Centre open to all the guides in Barcelona. 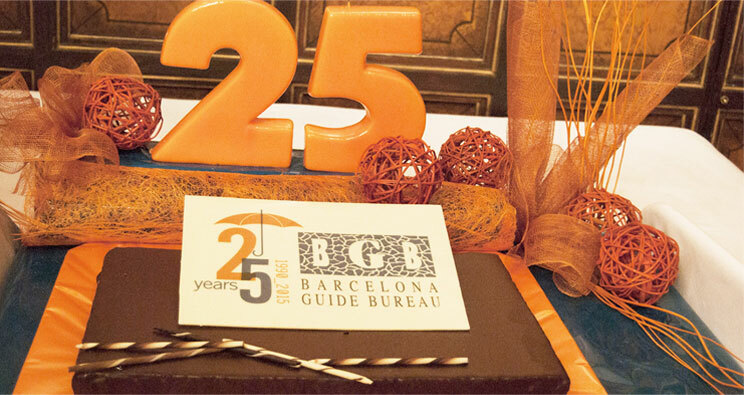 It used to be exclusively for BGB guides, but 15 years ago we opened it to all guides in Barcelona. We annually organise a course to train future Barcelona guides. BGB is committed to improve the sustainability of tourism, which is certified by Biosphere Responsible Tourism. In fact, we are the first tour operator with this certification. Each year TripAdvisor congratulates us with the “Certificate of Excellence”. Our customers’ opinion is very important to us, it helps us to keep alert and ensures our continuous improvement. We are always engaged in new projects. We are currently setting up a new website with a new booking system that will help our customers and ourselves to manage the Daily Sightseeing Tours. We are opening La Casa de la Seda next spring 2016 with regular visits and other special requests. We will manage the visits and promote the monument to hold events. Since 1990 I have had the privilege of leading this company. I thank all our partners and clients for their collaboration, and BGB members for trusting me in this job. I am President of the Board of Directors and General Manager. From now on we will separate these positions and the General Manager will be Carmen Turiera, who has already had the responsibility for some time, to whom I wish all the luck to manage the fantastic team of BGB. I will continue to be the President, at your side for anything you need for as long as BGB partners want. He is not an interuption on our work. He is the purpose of it. I would like to thank again all our clients and partners of BGB! We will keep in contact and work so tourism helps make Barcelona a better city to live in and a better city to visit.